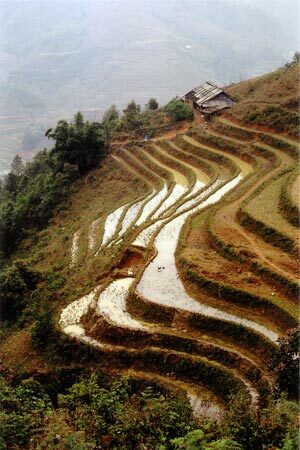 My final destination was Sa Pa. 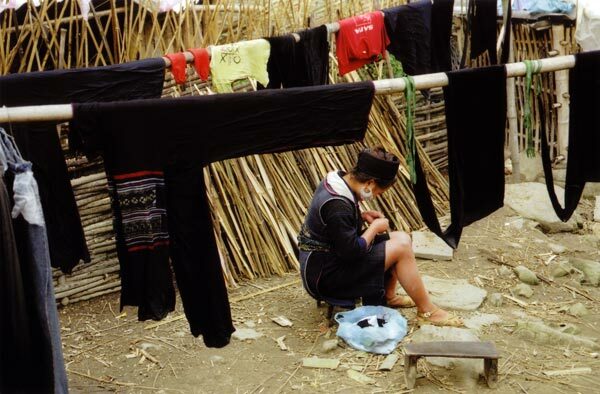 There, close to the Chinese border, in a breathtaking mountainous area inhabited by a number of hilltribes, the French built a resort town that really does remind one strongly of small French villages, save for the fact it is taken over by basket-carrying, exotically clad tribeswomen. 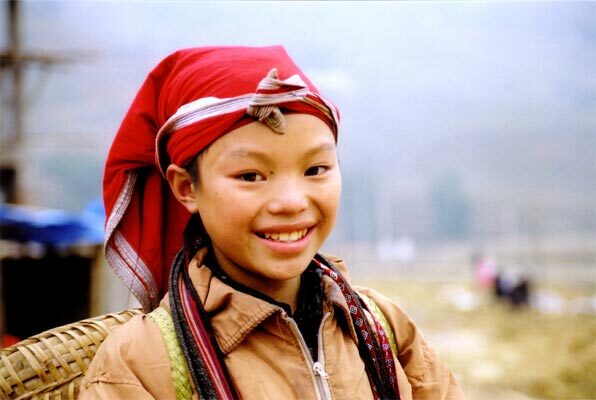 There are Black Hmong and Red Yao (the Vietnamese say Zao) everywhere. 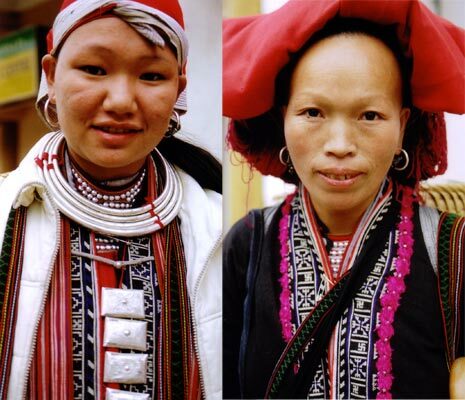 The former are related to the Blue Hmong I photographed in Laos, but characterized by their black outfit (actually indigo) enlivened solely by some embroidered bands, and a cylindrical black turban. 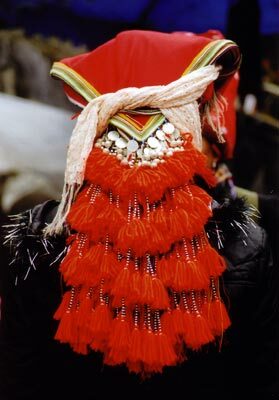 The Red Yao are spectacular with their large red coiffe made up of numerous scarves tied together, a profuse cargo of tassels and bells hanging in the back. That’s not even mentioning the silver-and-embroidery intricacy of their jackets and bibs, which had me goggling. 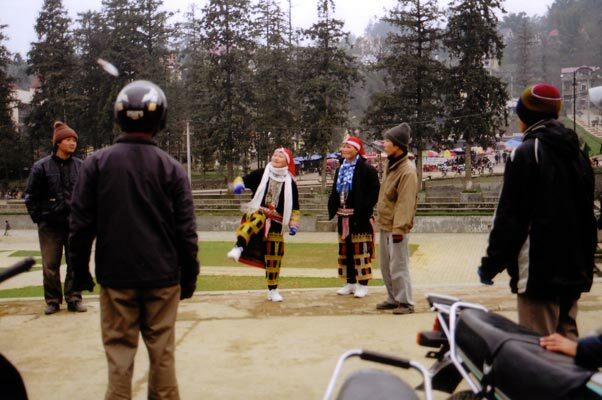 More discreet are the Black Yao: I only found two, playing "go lọm" with a bunch of motobike drivers in obvious attempts to keep warm while waiting for clients, because it was freezing. 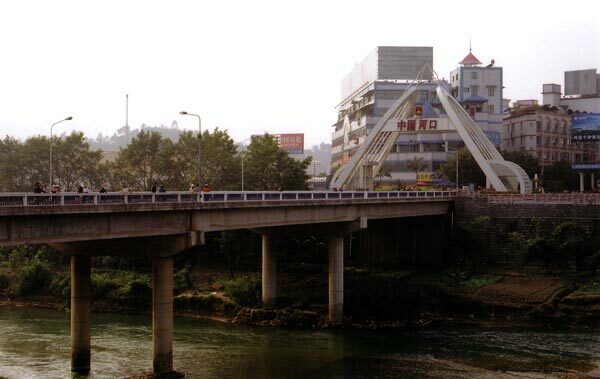 I'd arrived by night train, via Lao Cai, a true border town (read: dreadfully dead) whose sole attraction is that you can sit by the river and contemplate China. 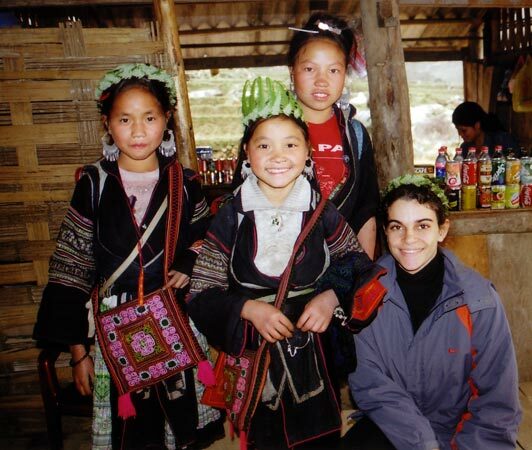 I had three travel companions, an Indian-Canadian woman and a British couple met on the tour, and I shared a room with the former in Sa Pa. There was no heating system, save a good old chimney, which really is completely useless in terms of heating a whole room. The warmest place in Sa Pa was the bus. 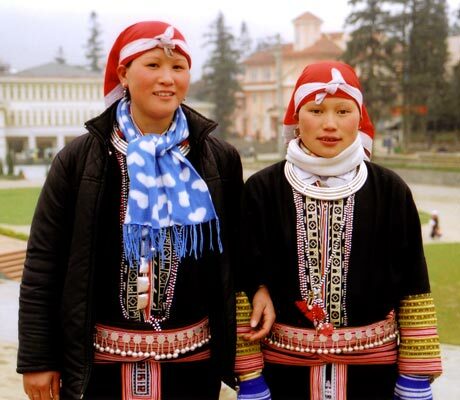 Young and older Red Yao, and their spectacular headgear as it hangs in the back. This street game is popular everywhere I went in Việt Nam. I joined in then asked what it was called, but am not sure "go lọm" is correct. Fortunately we spent very little time in the town itself, as we had some trekking to do, starting with a 14-km walk down into the valley and through villages. The valley is spectacular, rippling with wet rice terraces, dotted with small thatched villages, with a roaring torrent at the bottom: I suddenly felt I was back in Lebanon. 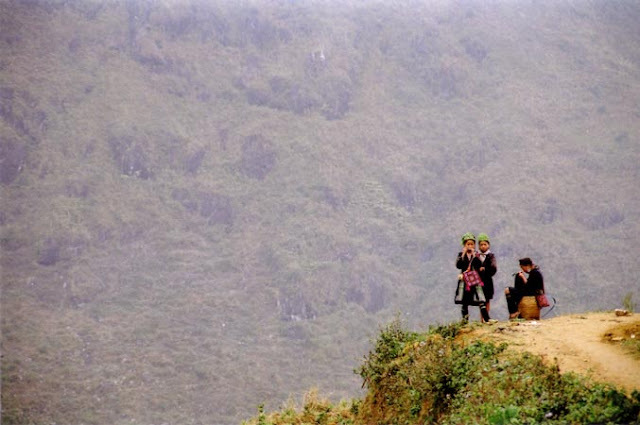 As it was the weekend, many Black Hmong were walking in the opposite direction, heading for the Sa Pa market. The dark outfits were a far cry from the New Year costumes but this soberness was elegant and becoming, with touches of colorful embroidery and silver in the large, intricate earrings. All had hands stained with indigo dye, which they make themselves from the plant, fields of which we crossed. All wore silver necklaces, even toddlers and men. Some of them had a strange circular mark on their foreheads. Our guide stopped a woman, who was carrying hemp fibres over one shoulder, to explain they wove their clothes from it, and pointed to her forehead to explain this was the mark of a suction cup, against headaches. 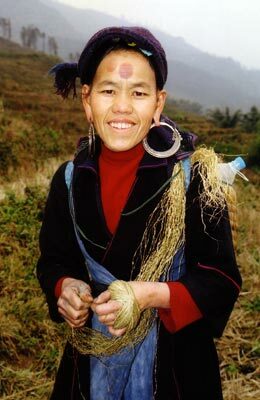 She was quite willing to be a subject for our education, and handed me some hemp before asking for my name. Her name was May' (or at least that's my rendering of how it sounded to me). We had the perfect guide, who knew the valley and its inhabitants well and could strike up a friendly chat for our benefit with any of them. He even joined in boys' games or borrowed their own merchandise to parody them trying to sell us something. School being out, there were many of these. They barraged us with innocent eyes and voices best described as angelic, voices so tiny and sweet you wanted to grab them and hug them: "Lukadisun? Lukadisun?" they piped while brandishing handfuls of bracelets made of ribbons. Eventually we figured out they were saying: "Look at this one?" Older girls were more dignified and had more elaborate items to sell, that displayed their budding but already impressive embroidery skills. And their marketing skills, as outwitting us into buying from them, using the little English they knew, seemed to be a challenge that amused them as much as they welcomed the profit. 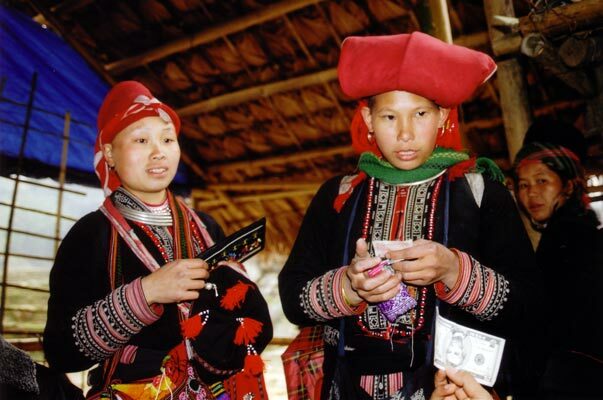 It would be a mistake for the visitor to expect wide-eyed, shy "tribals" in awe of the foreigner, hungrily dependent on what money he'd care to spend on their wares. I was really struck by how cheeky, independent, witty, friendly, even patronizing sometimes (in a funny way) these people were; should you tease them, they would jump right in and turn the joke back on you. 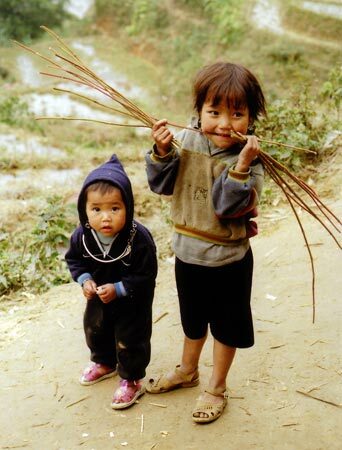 They were very curious, not at all self-conscious about their limited English, and an amused smile hovered around the lips of many, whatever their ages. Clearly to them we were amusing people, an interesting break in the tedium, and fair game to hog into buying something, always with a smile, always good-humoredly, and no hard feelings if they lost the game. When I said "No thank you" to women brandishing their wares at me, the immediate retort would be a mocking "Yes thank you!" Not all of them would try to make a sale, anyway. 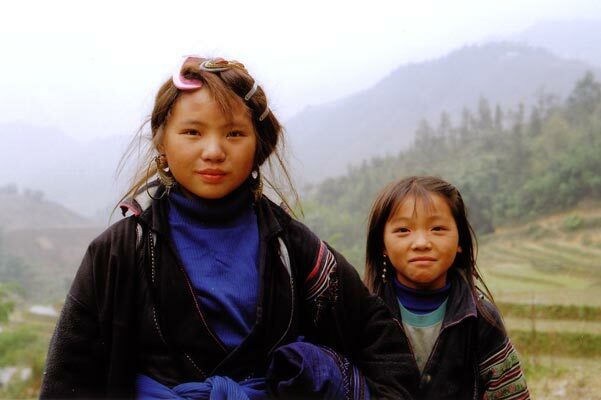 During the hike we met three girls named Tu, Su and Cu (seriously) who were just standing at a bend in the trail, fern crowns on the heads of the youngest two while the oldest, Tu, was bent over a bag she was embroidering. They decided to accompany us and peppered each of us with questions. "What your name?" "Where you from?" "How old are you? Oh, very young!" "Are you married?" They started giving me ribbon-bracelets as we walked, and Cu even made a fern crown for me. The girls walked us to their village, where we had lunch. I bought small bags from each of them and kept one for myself: it retains a faint smell of wood fire and natural dye that takes me back to that part of the world. Boys play a game where you throw your top to knock the opponent's out of the way. 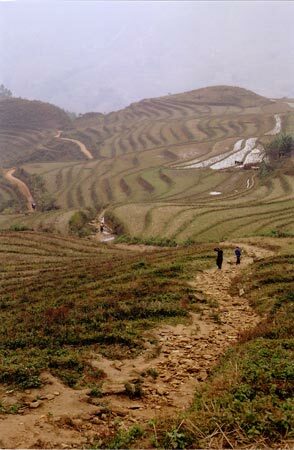 From that village on, we started meeting Red Yao as well. One girl left me speechless. She offered me ribbon bracelets and I had my excuse ready... but let me tell the story in pictures. Placated by the logic of the argument, I could only cooperate. It was a small concession to make for the portraits I shot of her in return, that are among the trip's best pictures. 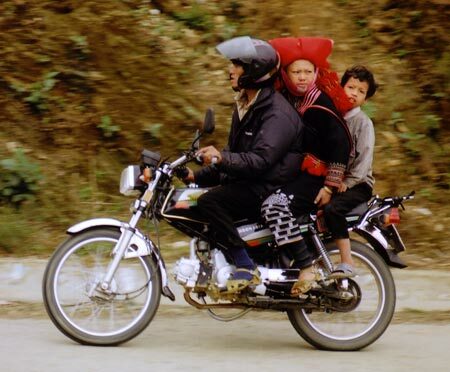 A traditional lifestyle doesn't exclude making one's life easier to go the few miles to and from the market. 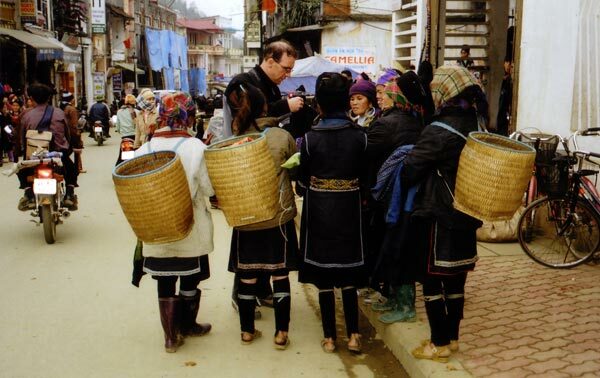 Later that day in the Sa Pa market I was literally cornered at a stall by two chipper granny-type Yao who cajoled me into buying things I didn't even identify till I got back to the hotel – and giggled off my sincere claims of "But I don't want it!" as if I was an unreasonable child in denial of reality. Despite my best attempts, I always got good-humoredly bullied into buying, but the prices were so ridiculous there was no harm done to my budget. The two unidentified pieces from the market that day turned out to be a full-fledged Yao tunic and accompanying belt, tassels and beads and all, so I was in fact delighted. 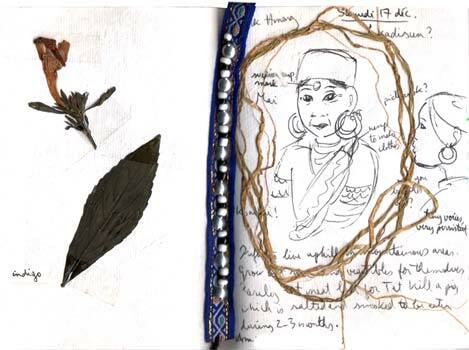 Majnouna.com, Cedarseed.com and all their contents are © Joumana Medlej 1997-2014. No part of the site may be reproduced without my permission. Previous lives of the website: Born in 97, reborn as Cedarseed.com in 02/02, makeover in 09/05 and 03/11, reborn as Majnouna.com in 04/12, current version since 10/14.